Historical reads can be hit and miss with me, but I had never read an historical-YA-paranormal-romance. Oh my gravy y’all, put it all together add in amazing characters, lots of action, and visual settings, it equals awesome! When we first meet Ismae she is a young teenager being sold off into marriage. Ismae doesn’t think much of herself, even though she is strong, she has been treated horribly by her father all her life. But she knows who she really is…who her real father is, and people that know are afraid of that. I risk a glance up at my husband-to-be, Guillo, and wonder if my father has told him of my lineage. I am guessing not, for who would pay three silver coins for what I am. It was such a joy to read about Ismae’s evolution. Ismae goes from being this rundown, low girl who seems to feel that having death (St Mortain) as her real father makes her no good and unlovable. But after Ismae is rescued by the Covent of Saint Mortain she discovers how amazing those who are sired by St Mortain can be. I loved watching her train in becoming a strong, kick but heroin assassin. Ismae's classes at the convent are not the typical ones you would think of. By the time Ismae goes out on her first assignment she knows all ways in which to seduce and kill a man. Oh, you know you want to read how she got to that point! Ismae in a round about way ends up being paired up with Duval. I LOVED Duval!!! He is everything you want in a leading male character. Duval is the brother of Anne the duchess to be and is extremely protective of Anne. Duval will do anything to protect the soon-to-be duchess and get her on the thrown she deserves, including defying others in his family. The relationship between Ismae and Duval is slow (in a good way). At first they can’t stand one another and there is no trust between them. As the story progressed there was nothing I wanted more than for Duval and Anne to find a way to be together. Whenever you are ready, or if you never are, my heart is yours, until Death do us part. The true turning point in Grave Mercy for me (trying for non-spoilery here) is when Ismae finally meets the two people (Um, maybe I should say beings, not sure on that one.) that had the biggest hand in creating Ismae from the beginning. You can probably guess who I’m talking about but meeting these people put a big chink in everything she had been taught at the convent about being a daughter of Death. 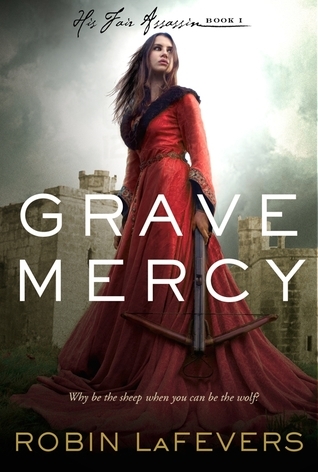 If you are anything like me you will love the slow build of Grave Mercy. Robin LaFevers does an amazing job at making her characters real to me. I wanted nothing more than to see them succeed! I can’t wait to read the next book in this series and find out if some of my favorite side characters make it or not. I know this is marketed as YA but I think of it more as a crossover. Yes, I think teens will enjoy it but also adults should not pass this one up. Obviously, this book is popping up everywhere in the blogosphere lately, but your review is the first that actually made me want to read this one...like right now! Yay! I'm so glad you loved this one, Rebecca! It's definitely one of my favorites, and I'm pretty sure it's going to make it to best of 2012. I can't wait for the next one, even though we're not going to see that much from Duval and Ismae... but I just know it's going to be worth it!